It's a great house, a perfect first home for them, but also one they can grow into down the line. As a bonus, it's only about a half hour from my house, unlike my older daughter who is 4 hours away! 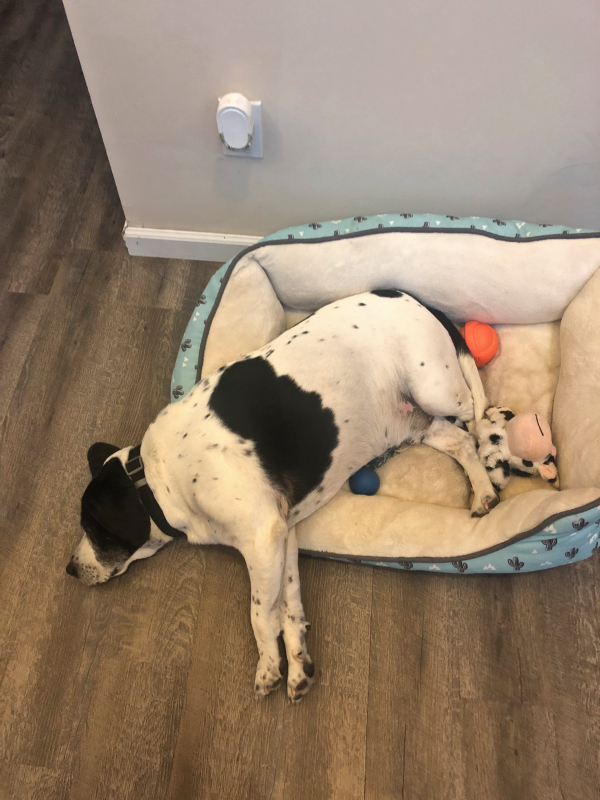 Right now it's just the two of them and their dog, Renfield (Rennie) who is still getting used to the new place, although perhaps he could use a bigger bed? One of the challenges I see in their beautiful new home is a lack of storage and counter space in the kitchen. 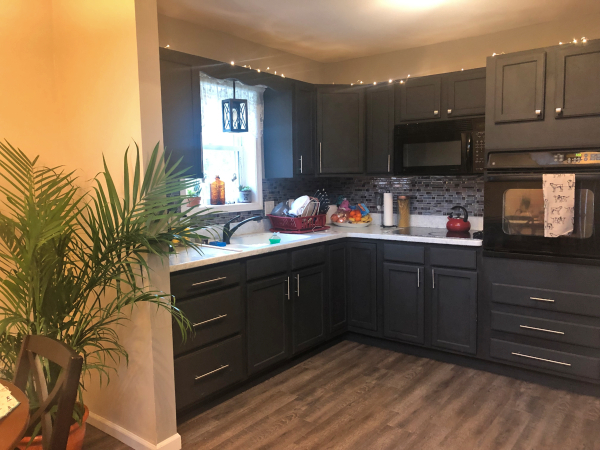 It's a wonderful kitchen, and far better than the kitchen in my first house, that's for sure...not to mention completely enormous compared to the 18" of counter space I had when I was living in the city! However, there is no dishwasher, and once they have one installed they will lose one of the precious few cabinets they have. They haven't been doing much cooking yet, since they are so busy with a million projects, but once they start they will realize that they could sure use a little more counter space. On the other side of the kitchen is a fridge with one of those useless tiny cabinets above it...you know the kind, you can only reach it with a step-stool and therefore only store things like holiday platters in it. I use mine to store entertaining items such as my ice bucket, platters, chip & dip bowls, etc. But mine is about twice the size of theirs. Next to the fridge is a small built in bookshelf, and under that the garbage can and Rennie's dishes. So basically what you see is what they have for storage and counter space. The dining room is adjacent to the kitchen, and there's a rather large opening between the dining room and the kitchen. I told my daughter she should start to keep an eye out for a narrow dresser she can turn into either an island or a peninsula, to help with both storage and counter space. She loves that idea, but said she will need my help with the design. So, naturally, I've been looking online to get some ideas for her! Here are a few great examples I came up with, any of which would be simple enough for them to tackle. This is absolutely gorgeous! The drawers were removed and replaced with pine shelving, which you can get it custom cut at your local Home Depot or Lowe's. They added a fresh coat of that glorious yellow paint and that gorgeous stained wooden top - I'm in love! I think the only thing I would change would be to add locking caster wheels on the bottom so it could be moved - it could then serve as either an island or a peninsula, and could also be used as a serving station for a party. This one is even simpler. They left the drawers intact, freshened it up with a fresh coat of paint and new knobs, and added a slab of marble on the top. A few hooks and a paper towel holder and it makes a great addition to the kitchen. The next three came from Refurbished Ideas - wow, what a great site that is! This kitchen is so bright and happy, what a wonderful place to have a morning cup of coffee - you couldn't help but smile with all those cheerful colors all around you! Again, they removed the drawers, and obviously removed the back as well. So cute! More happy colors! This has the butcher block counter top extending over the back to make room for dining. 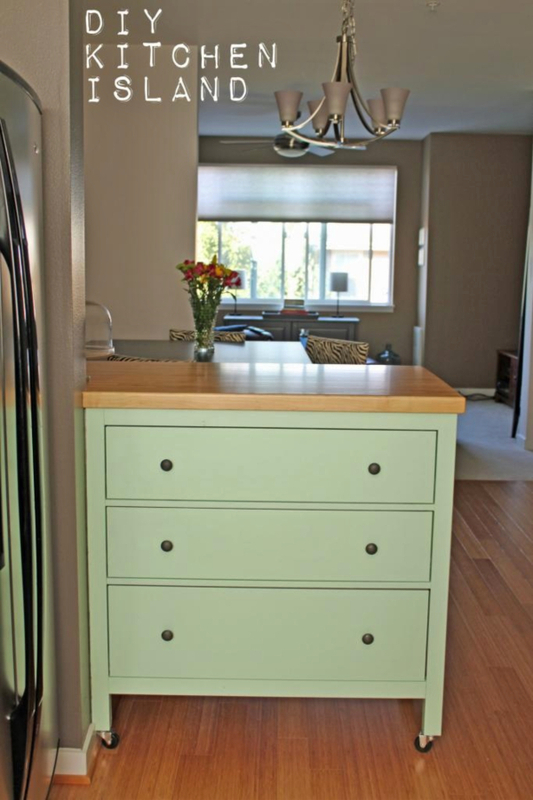 Another great example is this cheery green dresser turned island. I might use the 'dead' space on the side for spice racks, and the back could be used for a pegboard pot rack to add more functionality. Here's a perfect example of how to use the dresser-turned-island as a peninsula, although I would not bother notching out the counter. It isn't really necessary, and limits the functionality of the piece, should you want to use it elsewhere. Really, you are only limited by your imagination! This is a perfect project for a new homeowner, and will add so much functionality to a kitchen. Now I just wish I had an old dresser kicking around in need of a makeover! Omg I love all of these we definitely need one on wheels. Once we get nicer bedroom furniture, we may be able to repurpose Frankie's dresser into one! No doubt you'll find an old dresser at a garage sale in spring that will work perfectly - then Frankie's dresser can go into the guest room or the Posh room! Wonderful idea and great inspiration! I can't wait to see her put this into action, Penny! I love all those ideas! Our daughter and her hubby just bought a house and we are leaving in about 15 minutes to see it, as they just got the keys. I am wondering if this is something she could do a her space is also limited. Your daughters house and kitchen are so cute! That's so exciting, Mari, congratulations to your daughter and her hubby as well!! You have some great inspiration there! 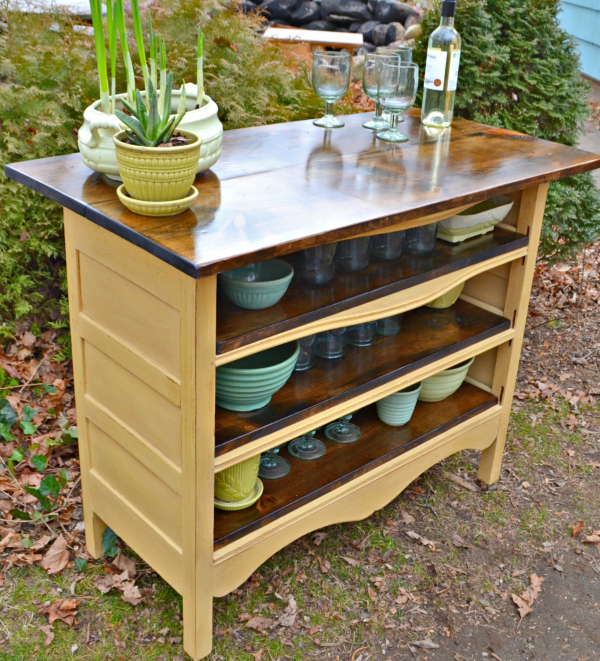 We transformed a vintage buffet into a kitchen island several months ago1. It's fun to reinvent furniture that had one use and transform it into a piece with a completely different use! Feel free to check our blog to see our project! Good luck finding just the right piece for your project! Wow, Cindy, I just popped over to your blog - you are a true transformation genius!! Gorgeous pieces you have created with your hubby, I'm impressed!! Lots of great inspiration photos, Debbie...functional and beautiful! I'm excited to see what they finally do, Linda! These are great ideas!! Little projects like these are my favorite and I am sure you will have lots of fun with it. I wish your daughter many happy and healthy years in her new home. I love what you did with the Ikea bookcases in your kitchen, Courtney! That's another idea for her, but since the closest Ikea is in NJ I'm not sure they are going that route....shame, isn't it? I wish they would bring one up to the Albany area! I LOVEEEEE THIS POST~ it is sooooo cute. I love those ideas! I also like the idea of a repurposed stainless steel medical rolly cart off to the side to hold extra ideas. We have two book shelves in our kitchen to hold baskets and appliances we use all the time. 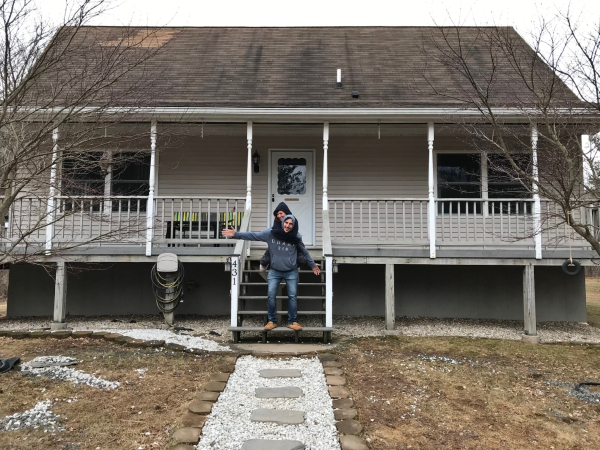 I can't wait to see what Shan does with the house! Yard sale season's coming up and I am sure they'll find something. We got a medical cart two years ago for only $10 at a yard sale, and Alex puts all his surfing gear on it now. Once we have a larger home, it will go back inside where it belongs... ha! That was a fun post to write!! I always thought that if I bought a house without an island in the kitchen I would make my own out of an old dresser. Now Shan can do it!! Rennie needs a bigger bed. And I just don't get why everyone has to have a dishwasher. I would not give up any of that pretty cabinet space (lucky girl) to put in a dishwasher. Seems a bit silly to me. But I'm kind of old school. I know kids don't recall this. But once we used to use our two hands to wash dishes. What a concept! I think once you get used to a dishwasher, it becomes a necessity in a kitchen, Brenda. You're only cooking for one, so it's no problem to do a quick washing up afterwards. I can't imagine not having a dishwasher when I entertain, that's for sure! I remember in my marital home we didn't have a dishwasher for years, until the Christmas I made my husband wash the dishes....that did the trick! 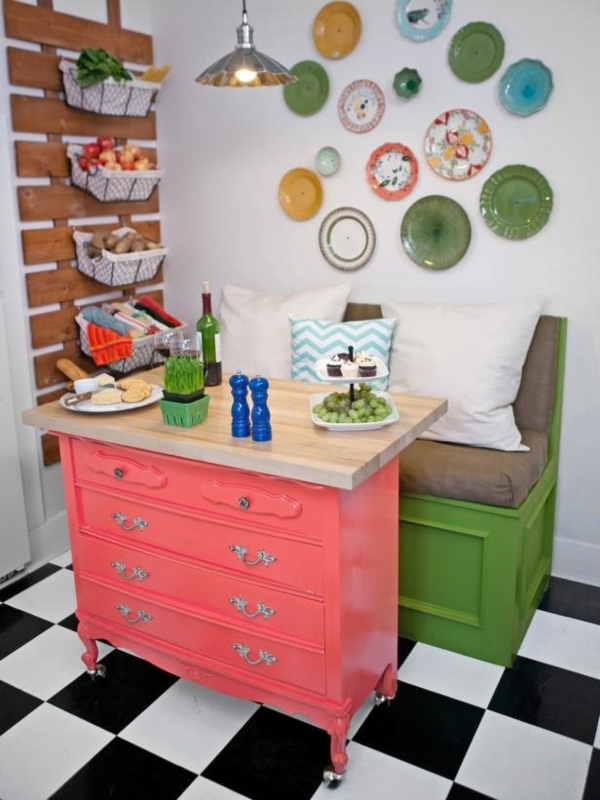 What a great idea to re-purpose an old dresser into a kitchen island! I don't know about your daughter's area, but around here, old dressers are easy to find on FB Marketplace and OfferUp. My mom had an old dresser re-purposed into a bathroom vanity and painted red - it's gorgeous! Oh that sounds so pretty, Melanie! I have bought many pieces through the years at garage sales, although not a dresser. I bought two dry sinks, a hutch/bookcase, a metal chemist's cabinet, and various end tables. There's also a good auction house not too far from them, and an indoor flea market. They'll find something!! Oh my gosh! I see people put dressers on the roadside all the time. I may have to do some dumpster diving! These are adorable! (I'm thinking wine bar). Love the idea and all the examples you posted. Can't wait to see what the final product looks like. I'm sure they will be keeping their eyes peeled for a decent dresser at all the spring and summer yard sales, PJ! Congrats to the new homeowners! I well remember the fun of feathering my first nest. This kitchen is gorgeous compared to my first kitchen, and has a good bit of space. 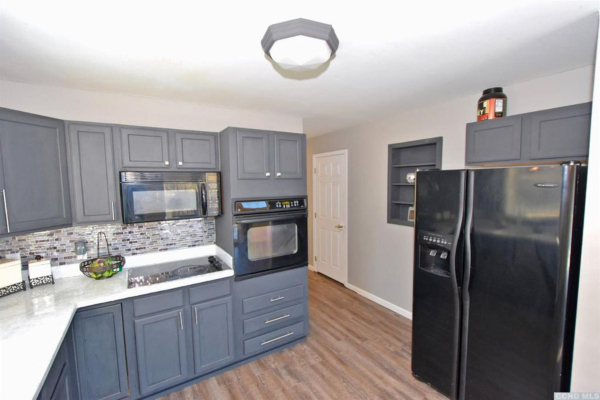 Personally, I like those little cabinets above the refrigerator. I have nothing above my refrigerator at the moment, and plan on having my builder put one in. I don’t mind getting up on a stepstool, what I do mind is having no space to store all of my goodies, particularly because I continue to bring things home from my parents’ house, most recently four beautiful Fitz and Floyd water pitchers. 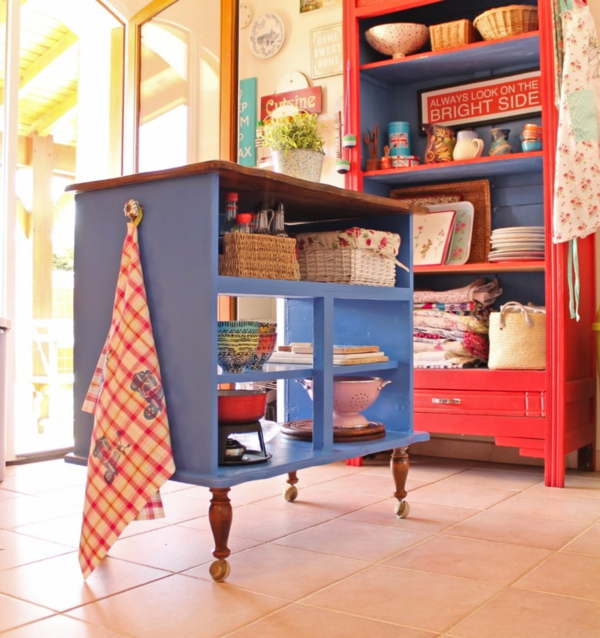 I love the idea of re-purposing furniture, and an island on wheels sounds like great fun. I’m hoping you will keep us posted on everything. I will definitely keep you posted, Pattie! My cabinet above the fridge holds a lot but theirs is pretty puny, so every bit more storage they can come up with will be helpful. Plus there's no pantry, so that's a big loss. My first kitchen was a disaster - I remember getting out my hammer and nailing the fronts of the drawers back on, they kept falling off! But I was still happy to have it! Oh wow how sweet of a cute house for your daughter. I love the porch. I used an old dresser for my kitchen island and love it. I love all these inspirational ideas for kitchen storage. Have a great rest of the week. 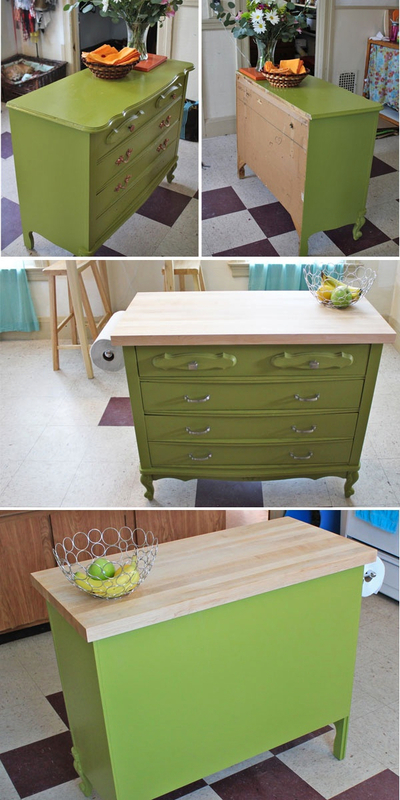 She could definitely find inspiration in your blog for re-purposing items, Kris - you're the queen of up-cycling! Debbie, their home is beautiful...I love that kitchen! And yes, they will definitely need more storage. I love all of those ideas...so what did you find and when are you getting started? ;-) Truly, they are so pretty and any of them would look great in their kitchen! Love and hugs! Ha ha, Benita, I did the homework now it's up to them to find the dresser and make it happen!! Mommy's got enough going on without adding more projects! The old dresser idea is absolutely brilliant. That extra storage and work space is priceless! So true, Leigh! I don't think you can ever have TOO much storage in a kitchen! Their first home is adorable. I still remember the excitement of buying our first home and I've been married 51 years! It's always exciting to start a new journey in life, especially when you are as young as they are. Love the island idea. It is adorable, Ann, isn't it? So cute, and just perfect for them!! My daughter is all excited at the moment as she has a pair of cardinals and a woodpecker at her feeder today! She's her mother's daughter, that's for sure! wow, I love this idea and never thought of it!! That first one is my favorite. I didn't know your daughters were bloggers too! They are!! My older daughter had a blog long before I did....now she has a new blog. My younger daughter started her blog shortly after I did...little copycat, ha ha!! Oh....and the first one is my favorite too, Karen Ann!! I love the contrast of the yellow with that gorgeous wood! Congratulations! What a huge accomplishment for a young couple. That's awesome. I love the kitchen and the idea of an island is fabulous...especially the ones you picked. Anyone of them would look amazing! They are having fun nesting in their new home, Kim, and I am enjoying watching them!! 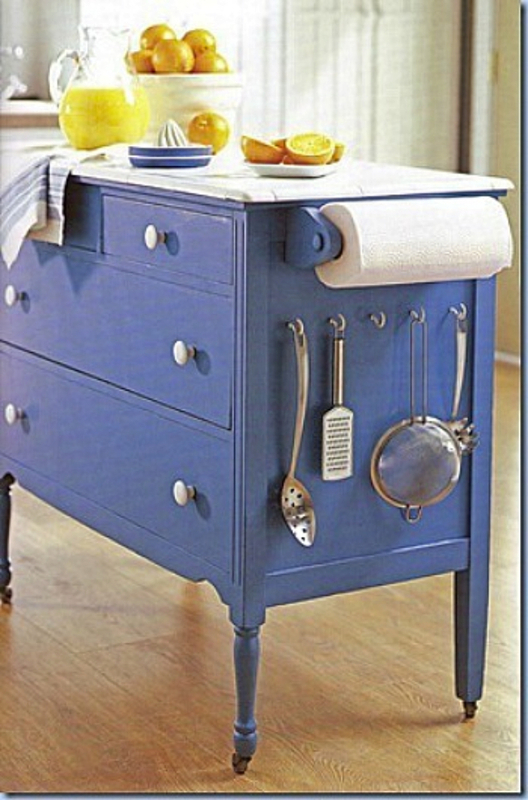 LOVE the idea of using a dresser for an island. I thought about doing that when I first moved into MWA, but opted for something else (for now). I think this is a perfect solution for your daughters kitchen, with that nice open space in the middle! She'll love it! I think she would love it also, Julie - she's excited about the idea, but of course it has to be a joint decision for them!